With the change of season upon us, I have been ticking items off my wishlist and trialling new products. Today I want to share with you what I've been wearing on my face recently and my thoughts. For some reason, I had accumulated many Charlotte Tilbury Wonderglow samples through the orders I've made, and as I have been loving dewy, glowy bases and primers recently, I thought I'd give it a try. It's particularly nice under the eyes to illuminate them before foundation, but I like to apply it all over too for a soft glow. So far so good and I'm actually really tempted to buy a full size version soon. As soon as I set eyes on the Illamasqua OMG Beyond Powder, I knew that I had to have it. But after some debating with my myself as to whether I needed it, Tom secretly bought it for me! I've only had it a little while, but already I'm super impressed... and it's huge! When applied to the tops of my cheekbones it perks up my complexion and gives it a lit-from-within glow. This can be easily be built up, starting out with a subtle shimmer, but then can be layered for an intense glow. I can't wait to see what else I can do with this (it looks beautiful in the inner corners of my eyes!) and I've already added a few other Illamasqua bits to my wishlist including this Maiden Powder Glitter Eyeshadow. 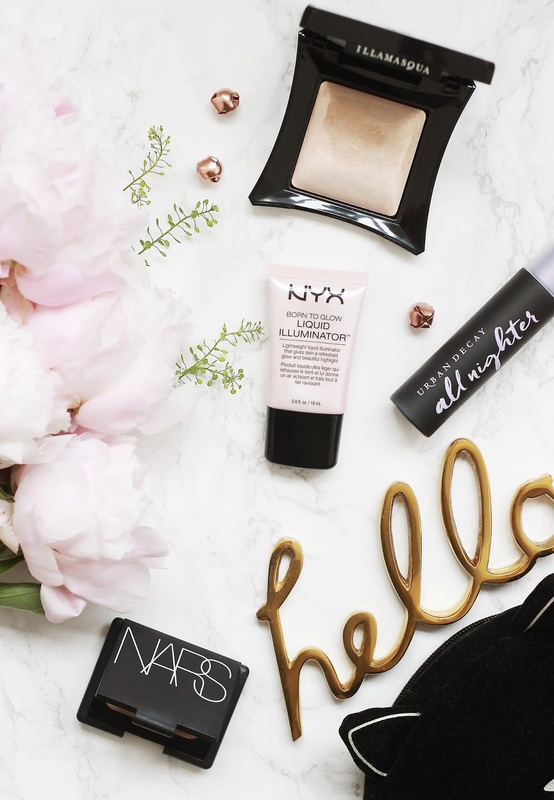 Another highlighter I have been wearing recently is the NYX Sunbeam Liquid Illuminator, a cheaper alternative to the Nars Copacabana offering. It applies super easy, blends in with my base without taking it off, and gives a understated sheen to wherever it is applied. Although slightly different in feel and intensity, once built up the shade and finish is uncannily like the Nars pick. Fun fact for you all, but I've loved the Urban Decay All Nighter Setting Spray* since before this blog was created. As someone who has suffered with oily, combination and dry skin throughout the years, this has remained a firm favourite. I've gone through bottles of this stuff, but having it back in my routine just in time for the warmer weather was a delight. I personally like to spritz it on my skin after my primer as I find that it keeps my makeup on all day long, then I apply a little bit after I apply my makeup if I need some extra assurance. The Nars Kalahari Duo has been a must have of mine recently as I've rekindled the love with this copper pick. With just a few moves, you can have a quick, easy eye look done in minutes - Perfect when you're in a rush.